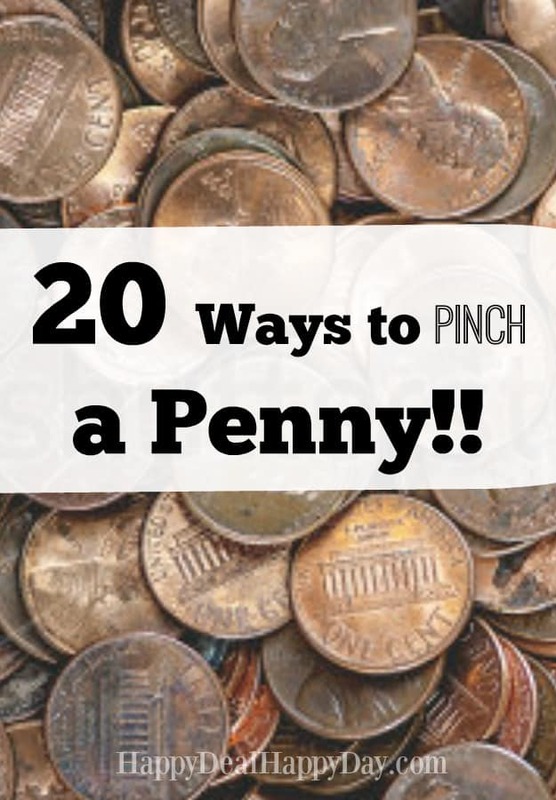 20 ways to pinch a penny Archives | Happy Deal - Happy Day! 8. Clearance: Be willing to take the time to scan clearance isles or end caps at stores. You never know what treasure you will find. One time at Bed, Bath & Beyond, I found a half set of dishes that matched the set I already had. I came home with more mugs and plates at a fraction of the cost of the original price. I also found a broken picture frame clock. I took off the broken clock parts, and still had a very cute picture frame that cost about $3, compared to $24! 9. Shop for gift items all year round! Whenever I see a deal that looks great, I always think if I can use it as a birthday or Christmas present. I seriously shop for Christmas and birthdays all year round, and usually have gifts months in advance. You may remember reading about this in Planning Ahead Can Save Big. I’ve had my daughter’s birthday presents for months, and have some ready to go for Christmas as well! 10. Fill Out Online Surveys. Remember the How to Save on Entertainment post? That shows you places you can sign up to complete paid online surveys. You an earn anywhere from $5 to $75 for answering surveys online! 11. Do-It-Youself! I’m sure everyone is aware that it’s always cheaper to do something yourself, than to pay for someone else to do it. You do have to consider the time trade-off as well. But if you are handy, and the time investment is worth the money savings, then complete projects yourself! 12. Get creative – think outside of the box. Use your freebies for things you may not normally use them for. For example, make a Plarn Tote, Coffee Filter Wreath, or your own Thank You Notes using Shaving Cream and Food Coloring! 13. Buy in bulk and split with a friend. If you’ve avoided stockpiling, or buying in bulk because your family won’t use that product before it expires, then consider teaming up with a friend or family member and split the costs in half for even more savings! My sister-in-law has a membership to Costcos – and I’ll give her some $ and split some of the food items you can get when you buy in larger quantities! 14. Buy produce in season or grow your own. We all know buying produce in season makes for a cheaper price. Plus it is just fun to be outside with your family, picking delicious berries that you can freeze and enjoy in the winter! Or be willing to get ugly organic produce for a fraction of the price through Misfits Market. 15. Repair if possible! I think one way I’m trying to get better at this is with clothing. In the past 6 months, I have had 2 shirts that I really like, but got holes in the armpits. I’ll admit that I’d rather just throw them out, than sew up the stupid hole. Then I can go shop and replace them. But that’s just lazy – so I sewed up the holes. This repairing principal obviously applies to many, many things – not just clothing! Or check out my ottoman my cats ruined, but I didn’t put it in the dumpster. I learned how to reupholster it instead! 16. Borrow or trade: I’ll admit that I like trading better, so I don’t have to keep track of items I may have to give back to a friend in the future. One of my friends used to host a “trade your clothes” party. We’d all bring items we didn’t want anymore, and then we’d sift through the pile ourselves to see what we wanted. If anything was left over after the party, it was donated to Salvation Army. 18. Be honest about what you need for birthdays/Christmas: I’m lucky that I have a family where I can be open and honest with and tell what I need/want when it comes to gifts. That way I know I’ll get something I’d probably spend money on myself. Gifts are usually not a surprise this way, but I never have to worry about putting on that “oh gee thanks” smile when I really don’t mean it. Plus I’m saving money from what would come out of our budget! (since I have Amazon Prime.) We also jumped on board and recently subscribed to Pureflix. We pay $7.99 a month each for Netflix and Pureflix streaming. We’d have to pay $50+ for cable, and more than half of what is on cable, we’d never watch. 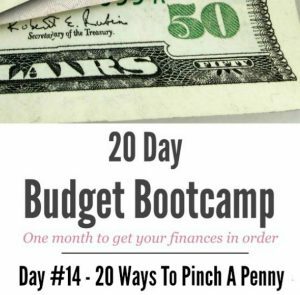 BONUS: Have a Budget and Stick to it! This is just another reminder, that keeping track of finances simply just doesn’t work without a budget! If you keep track of all of your spending by typing in receipt totals into a spread sheet (which is what I do about every other week), you’ll know exactly where your money is going and won’t be shocked when you have less than you thought you did! It makes for guilt free shopping, and a visual motivator for any item you are saving for! I’d love love LOVE to have input from you on even more ways you pinch your pennies! Come tell us what you do over in our Budget Challenge Facebook Group!